Some of our friends have gotten crafty this week too, and we just have to share their videos! First is a DIY Gingerbread House from our dear friends at A Tonk's Tail. I love my Target gingerbread house but I might just ask Mommy to make one of these for me another year! We also loved the Christmas tree made out of paperback books that one of our favorite authors, Amanda Flower/Isabella Alan created. Also starring in the video are Amanda's famous cats Cheeps and Tummy! We're joining Athena's Caturday Art blog hop. Crafting is a form of artwork! Do you enjoy Christmas crafts? What kinds of things have you made? Mom certainly has enough books to make a book tree - if only she was that ambitious!! Nice decorating, Mudpie (and Melissa). I'm sure Santa w/b stopping at your house! I love your KatKabin, Mudpie. It's so cute! And those videos were so fun to watch. I love doing arts and crafts, and I try to do a little art each day (and of course my furbabies love to "help" me!). Purrs! I love Amanda's book tree! Glad to see she had plenty of cat assistance. Miss Mudpie, great job- I bet you are going to win. Whoa! Four Plush Grumpy’s?!! We don’t got any but we have other plushies. Hope you win. We love what your mom did to your SkratchKabin. You know who enjoyed that book tree video? Paprika! She was enthralled! Started out on my lap, then proceeded to the TV and watched till the end. Now she is teed off that it is over!!! Lil Bear, who wants mom to make one too. Pawesome post! 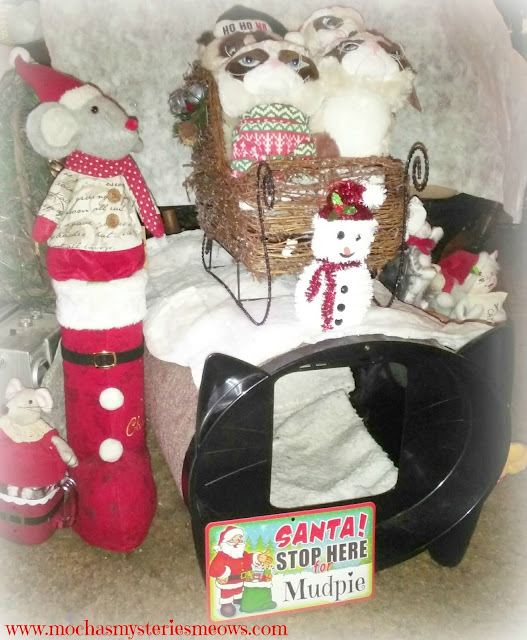 And thanks for sharing our crazy mommy's DIY project - MOL!